The Central Bank of Costa Rica (BCCR) warned the population that a message circulating on social media and in SMS messages about the alleged circulation here of counterfeit ₡5,000 bank notes is completely false. The messages include, in some cases, a link to a news report about counterfeit money in other countries. “Those messages are fake and do not correspond to any situation currently happening in Costa Rica,” the BCCR said. The bank indicated in a news release that those messages are the same that went viral in January in Venezuela. Messages there warned people about counterfeit 5,000 Bolívares banknotes. Current ₡5.000 banknotes (worth about $10) began circulating in November 2016 when the bank released a new series of bills with improved security measures. The BCCR is asking people to, when in doubt, “touch, watch and turn” the bills, meaning that those security measures can help them identify counterfeit banknotes. 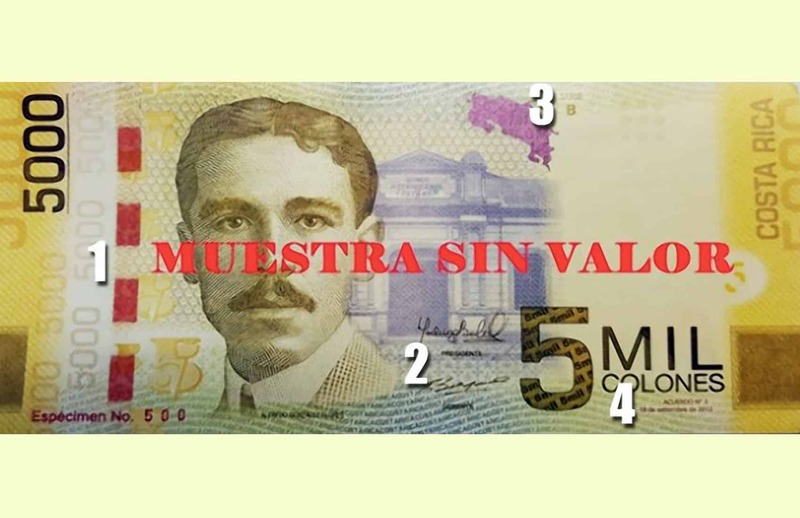 Verification measures include touching the texture on the “5 Mil Colones” text and the “5000” printed on the bill; you can also hold the bill against the light and look for the watermarked image of President Alfredo González on the right. The image should look exactly the same as the one printed on the left side of the bill. The bank also advises people to turn them to observe a “movement effect” in the symbols printed in the red security thread and the color change on the Costa Rican map at top right.